We take this as a sign that BMW doesn’t think the 2 Series will cannibalize 4 Series sales. It was cars like the BMW 2002 that set the precedence for the automaker’s designation as one of the few car manufacturers that could build an incredibly well-rounded vehicle, striking a balance between practicality, comfort, and a driving style that finds the happy medium between sporty and relaxed. Those qualities are all embodied in the 2 Series, although BMW’s smallest car is also part of a new push by German automakers to appeal to younger buyers looking for a gateway drug into the luxury lifestyle. As such, BMW cannot afford to let the 2 Series go stale. That’s why our spy photographers have been busy working to capture evidence of new 2 Series variants out testing. We spotted the 2 Series Gran Coupe making rounds at the Nurburgring last June and that was followed by a sighting of the refreshed coupe in November. 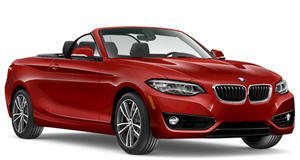 Now, we’ve caught the latest interpretation of its convertible counterpart driving on surface streets. As we saw before, it seems that BMW is confident with the 2 Series’ styling because its hardly changed anything. The bulk of the camouflage resides up front, hiding new headlights and a smaller grille. The lights up front will now be LED daytime running lights. At the rear will be new tail lights featuring updated graphics while the 2 Series will gain a revamped interior, hinted to us by a covered up dashboard. Expect to see a new infotainment system and a wider array of trim options underneath these covers. When BMW reveals the updated 2 Series in the later part of 2017, don’t be surprised to see updated engines that should help keep the Bimmer compliant with European emissions requirements despite the fact that the EPA is facing a potential softening of its stance on stringent emissions standards. Given that this is nothing but a light refresh and not a complete revamp, it falls under BMW’s LCI refresh category, which recently saw small alterations made to the 4 Series.